Tuesday 15th to Saturday 19th September: Trip to the New Forest. Tuesday 13th October @ 8pm: Scientific Methods in Archaeology. Lecture by Dr Caroline Cartwright. Tuesday 12th November @ 8pm: The History of the Royal National Lifeboat Institution. Lecture by Keith Cunningham. Sunday 6th December: Christmas Party at Avenue House. Further details coming soon. Tuesday 10th January @8pm: Royal Palaces of Enfield. Lecture by Ian Jones (EAS). Tuesday 9th February @8pm: Medieval Middlesex: The Archaeological Remains. Lecture by Adam Corsini. Tuesday 8th March @8pm: Crossrail Archaeology Project. Lecture by Jay Carver. All Lectures are held at Stephens House & Gardens (Avenue House), 17 East End Road, Finchley, N3 3QE, and start promptly at 8.00 pm, with coffee/tea and biscuits afterwards. Non-members welcome (£1.00). Buses 82, 125, 143, 326 & 460 pass nearby and Finchley Central Station (Northern line) is a short walk away. This good news contrasts sharply with Barnet Council’s closure of Church Farm Museum in Hendon in 2011 and the selling of the artefacts at auction, leaving a Grade II* building unoccupied. The building is still empty (Summer 2015) and no doubt, like all empty buildings, gradually deteriorating. Bromley Council likewise are closing their museum at the Priory (another Grade II* building, and said to be the oldest building in Bromley) and moving the displays to the local library. According to a history teacher in Bromley “The National Curriculum has a focus on local history” These decisions deprive children of another way to explore their local environment. Why do we dig? We have documents, maps, photos, even eye witness testament at Clitterhouse Farm. We have standing buildings that tell their story, and the landscape and visible traces of the past above ground. We can see that the farm buildings sit on raised ground in an area of wider hills. Clitterhouse playing fields are a survival of green space that was a working farm up to the 1920s - Cows grazed through fields in living memory. So why do we need to open up trenches today? 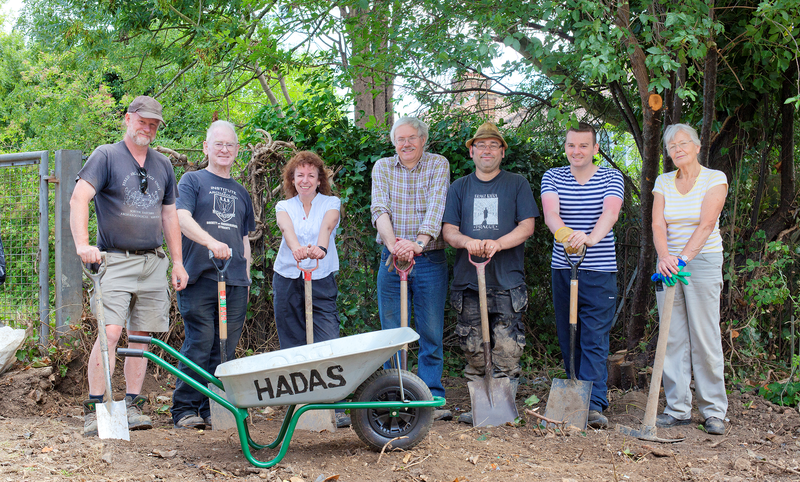 HADAS was invited by the Clitterhouse Farm Project to help them piece together the past history of the site they have helped to save and want to put to wider community use. The group just recently created an onsite café on 18th July - which we were able to use as our site hut for the duration of the dig. Surely, a contender for site hut of the year. Sitting on the pew-like seats the land falls away immediately to the north and east. The site has commanding views over the local area you can see the green roof of the former Medical Research Centre on the Ridgeway, Mill Hill, the spire of former Christ College School in Finchley and all the way round to the churches of Hampstead. An archaeological dig is a destructive process: as much as it reveals a glimpse of the past, it also destroys. If you scrape away with a trowel you may pick up much of interest but sometimes you need a mattock to get to the bigger picture. We need to keep those trenches straight so we see the past in those sections. We found traces of the recent past and as far back as the 16th century in one trench. In another, deeper in history, we’ve gone back to the 12th century. Whether this tells us a clear story of the site or just muddies the waters, will take analysis, which we need to work on, and more trenches next season may be dug. Armed with such knowledge as well as all those evocative maps and photos we may be able to clear those waters given time. Talking about muddy waters, that 12th century pot was found in a trench we dug over the suspected moat. Ah, a castle, no. A landscape garden or ornamental pond? Don’t know. Drainage ditch? Probably. It was wet, with a silty layer. Back in the lab, we are examining these silts for signs of life, cleaning, identifying and documenting finds. There were three drainage pipes draining into the alleged moat and the bank was loaded with Victorian or later builders’ rubble. We have a witness in her nineties (a visitor from the local community) who remembers the moat or ditch being open in the 1920s, to travel back further in time we need the archaeology to talk. We dug at Clitterhouse Farm because we wanted to evaluate what we might find. Are those historical records correct, do we know what they mean, can we add something new, something more human? Finds are traces of the past. We learn most by looking at context, how objects connect in space and time, numbers of finds, and where they sit in the earth that we dig. So soon enough, in an issue or two, we may be able to tell what all the stuff means, be it animal bones, wine bottles, oyster shells, pipes, smoking and drainage, or, of course, pots. In June this year I organized a weekend tour to various sites in the Stonehenge area for fellow Birkbeck students as part of the Birkbeck Archaeology Society. It was well attended and included private access inside the Stonehenge circle for an hour and a free coach paid for by Birkbeck. We had a busy itinerary and were accompanied by our Archaeology lecturer Doctor Tim Reynolds who provided verbal and written information for each site. Leaving on the Saturday morning from Gower Street our first stop was Old Sarum, the site of an Iron Age hill fort, medieval castle and cathedral. After this we went to Woodhenge and Durrington Walls. Durrington Walls is a Neolithic to Bronze Age site. There is not much to see at the site today apart from the information boards, but once it was a hive of activity. Durrington Walls is a sub-circular earthwork 480 metres in diameter with 6 metre deep ditches which were 16 metres wide and with 3 metre banks it must have been quite an impressive site when it was constructed between 3100BC and 2400BC. Next to this were some sad looking posts to show the layout of Woodhenge, constructed [in] 2470BC to 2000BC. It is slightly oval with its long axis approximately in line with midsummer sunrise. There were 168 posts, the deepest were 2 metres deep and estimations have predicted that they could have held timbers 7 meters high! After this we spent several hours in the wonderful city of Salisbury with its cathedral and Archaeological Museum apart from other attractions. It was a very picturesque place and we walked along the side of the river to the centre of town. The skeleton called the Amesbury Archer discovered in 2002 and dated to 400BC is in the museum here. The burial contained the earliest gold object in Britain and stable isotope analysis suggests that he came from the Alps - the reason for his epic journey is still debated. Then on to our overnight accommodation hired solely for our use at the YHA Cholderton, close to Stonehenge for our early departure the next morning. Apart from having good quality clean rooms it is also a rare breeds farm where you are free to wander the grounds looking at the animals and can even feed the baby animals. The next morning was an early start to visit the Stonehenge World Heritage Site for our private access to the Stonehenge circle. There are 2,000 hectares of ancient landscape and 450 Scheduled Ancient Monuments. It was strange and almost peaceful to be at the visitor centre before it was open and the rush of tourists. We had time to view the Prehistoric reconstructed houses and read the panels. It involved some fellow students trying to get into the mood of the moment by seeing how it felt to move those stones! Then we were taken to the site itself and it was an amazing experience to be able to walk into the stone circle with no-one there apart from fellow students and friends. There are a series of monuments on the same site, the first stage from 3000BC to the fifth stage up to 1520BC. The Stonehenge Hidden Landscape Project has discovered 15 new ‘ritual’ monuments in the environs. Tim gave a talk about the circle and then people wandered the site. It is indeed a very special place and I felt humbled to be there. After our hour was up we reluctantly left the circle and went to see the museum and also the reconstructed prehistoric houses outside the museum. Finally we were on our way to our next destination, Maumbury Rings (in Dorchester, Dorset), a henge roughly 85 metres in diameter with a single ditch and bank. It was a Neolithic Henge re-used as a Roman Amphitheatre and much later as part of the Civil War defences of the town - nowadays it is a quiet spot to explore and soak up the atmosphere. Then the final visit of the weekend: the wonderful Iron Age hillfort of Maiden Castle, south west of the town,. This site originates from a Neolithic causewayed camp and Bank barrow. In its later stages it was the site of a Roman temple. It is truly impressive and we were lucky to have good weather to explore the sitet. Sunday was a lovely sunny day, and a large crowd turned up to enjoy the fun and activities. HADAS had a stall to advertise the Society and we took the opportunity to wash some of the finds from the Cromer Road School excavation. We made some useful contacts, sold some books and gave out a number of membership forms. Thanks to all the members who turned up in support. In the afternoon of Wednesday 8th July 1772 the bodies of two highwaymen, Guyant and Allpress, were brought to Finchley Common from Tyburn, where they had been executed, and hung in chains. The location of the gibbet had caused great consternation and would continue to do so for some time. Workmen had, during the morning, been preparing the site, opposite the end of Bauvies Lane on the Common [if anyone has the precise location for Bauvies Lane I would be pleased to hear about it] and had met with ‘great opposition from the neighbouring gentlemen, whose houses would have been greatly incommoded by so disagreeable a prospect.’ Following this the Sheriff agreed to alter the plan and put the gibbet on a piece of ground near the ‘Horse-shoes’, a site deemed less offensive to anyone. The workmen carried out this task at the new location. However once the Sheriff’s party had moved on it was discovered that the bodies were hung opposite, although some way off from, the house of Edward Allen, Esq., Lord of the Manor of Finchley, and where he had just cut down some trees and made other improvements to extend ‘his prospect’. Through pressure from Edward Allen the bodies were removed to Hanging-Hill, on the side of the Common near to the last person hung in chains there for a similar offence. This appears to be in the Colney Hatch area. On Sunday 12th July in the afternoon ‘a great concourse of people’ came to see the bodies. Three pickpockets were detected, one of whom escaped, but the others were taken to a neighbouring pond and ‘ducked in a very severe manner’. The last that is heard of this episode is early in 1773 when it was reported that the body of Guyant ‘was blown down by the violence of the wind’ on the night of Tuesday 23rd February. On Wednesday 24th the body was interred on Finchley Common when the ‘populace drank several gallons of beer over the grave’. Note: Footnotes are at the end of the newsletter. I am lucky enough to volunteer at this world renowned gem of a museum. It is part of UCL and is located on their campus near Gower Street and has a real old feel of what I would call a traditional museum with so much to see! That is just the items on display, not the ones in the display drawers that can be pulled out nor indeed the items in storage. The museum collection is around 80,000 objects, many excavated by Flinders Petrie over the course of his long career. Petrie excavated dozens of major sites including Roman period cemeteries at Hawara, famous for the mummy portraits, Amarna the city of Akhenaten, and the first true pyramid at Meydum. The Petrie museum has a long history and recently celebrated its centenary. It was Amelia Edwards, an author, traveller and lover of Egypt, who donated the original items. Amelia Edwards also funded the position of Egyptologist at UCL that William Flinders Petrie was to hold. She liked UCL because it allowed women to study there. I was asked to assist a visiting Egyptian scholar with translations of William Flinders Petrie’s handwriting in his notebook and diaries. It was really interesting and amazing to read the precision and incredible details recorded by Petrie of the excavation. He recorded details on weather conditions, the health of his fellow excavators, drawings of excavation finds and even recorded payments to the excavators. It helped you to get a feel for what was happening on the excavation and Petrie himself. Author reading Petrie’s diary from Abydos dated 1903. On a nautical theme, a perfectly preserved gun carriage has been raised from the site of the seventeenth century warship London off Southend in Essex. The 1.6 metre long, 70 centimeter wide piece of artillery equipment would originally have held a 9 foot long cannon, capable of firing 24 pound cannon balls up to two miles. Archaeologists will study the carriage to see if the gun it held could still be in the sea or if it has already been brought up. They will also see what type of wood was used, Elm was preferred as it shattered less in combat and reduced casualties but there was Dutch Elm disease from the 1650s onwards so they had to use Oak. The London broke in two when it exploded two miles off Southend in 1665. The cost is £150. You can enrol at the first meeting but if you have not attended the Society’s meetings before please contact the Secretary, Peter Nicolson, on Tel: 0208 9594757 beforehand. 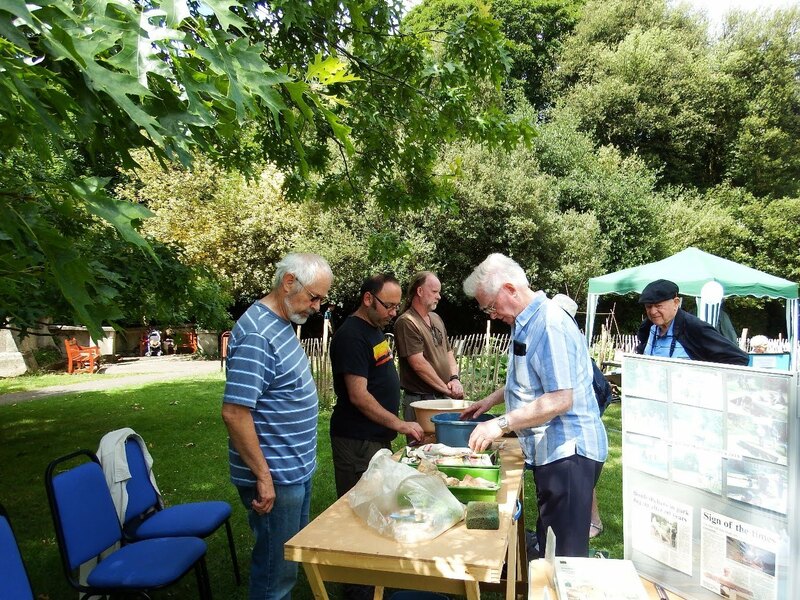 Saturday and Sunday the 12th and 13th of September, 11am-6pm, the Enfield Archaeology Society and Enfield Society have stalls at the Enfield Town Show, Town Park, Cecil Road, admission £5. Friday the 18th of September, 7pm, COLAS have a lecture entitled “In the Dog House: The varied fortunes of Salisbury Hall and Walthamstow Stadium car park” by Ian Hogg. At St Olaves Parish Hall, Mark Lane, EC3R 7LQ, Admission £2 for non-members. Sunday the 20th of September, 10.30-1pm, the Amateur Geological Society have a guided 3 mile walk of the Geology of Hampstead Heath led by Diana Clements. Meet at The Flagstaff, Whitestone Pond, Heath St, NW3. Thursday the 24th of September, 8pm, Finchley Society is having an outreach meeting discussing matters relating to East Finchley. At Holy Trinity Primary School, East Finchley, N2. Non-members £2. Monday the 5th of October, 1pm, Bones of contention by Michael Marshall. Monday the 12th of October, 1pm, Mass burials from St Mary Spital by Don Walker. These are all part of the Gresham College series of free Monday Archaeology lectures at the Museum of London, 150 London Wall, EC2Y 5HW. Friday the 9th of October, 7.45pm, Enfield Archaeology Society lecture entitled “London in the not so Dark Ages” by Lyn Blackmore. At Jubilee Hall, 2 Parsonage Lane, Enfield, EN2 0AJ. £1 for non-members. Saturday the 10th of October, 10am, Enfield Society is having a heritage walk around Edmonton by Monica Smith. To book free places send details, phone no and S.A.E. to Heritage Walks, Jubilee Hall, 2 Parsonage Lane, Enfield, EN2 0AJ. A maximum of 4 tickets per request. Monday the 12th of October, 3pm, Barnet Museum and Local History Society lecture entitled “Music halls, theatres and picture houses:” A walk down memory lane by John Lynch. At Church House, Wood St, Barnet, (opposite the museum) £2 for non-members. Friday the 16th of October, 7pm, COLAS have a lecture “Turning the Tide: the first year of the National Citizen Project” by Gustav Milne. Recording vulnerable archaeological remains on England’s coast. Non-members £2. Friday the 16th of October, 7.30pm, Wembley History Society have a lecture entitled “Women workers in World War I” by Christine Coates. English Martyrs Hall, Chalkhill Rd, Wembley HA9 9EW. Non-members £2. Monday the 19th of October, 3pm, Enfield Society have a lecture entitled “The Bloomsbury group” by Janet McQueen. See Saturday 10th October for address. Wednesday the 21st of October, 7.30pm, Islington Archaeology and History Society have a lecture entitled “Darker stories from history” by Jessica O’Neill. At Islington Town Hall, Upper St, N1 2UD. Non-members £1. Thursday the 22nd of October, 6pm, Gresham college lecture entitled “Agincourt or Azincourt. Victory, Defeat and the War of 1415” by Helen Castor. At the Museum of London. Free. Wednesday the 20th of October, 6pm, The Royal Historical Society Annual Colin Matthew Memorial lecture. “Free speech and the study of history” by Timothy Garton Ash. Part of Gresham College held at the Museum of London. Free. Wednesday the 20th of October, 7.45pm, Friern Barnet and District Local History Society lecture entitled “Loving Barnet” by Gail Laser. At North Middlesex Golf Club, the Manor House, Friern Barnet Lane, Non-members £2. Saturday the 24th of October, 9.45-4.30pm, Edmonton Hundred Historical Society day conference on “Magna Carta, the mayoral charter and the Edmonton Hundred”. For more details and booking please contact Jubilee Hall, 2 Parsonage Lane, Enfield, EN2 OAJ. Full day £12, half day £6. Thursday the 29th of October, 8pm, the Finchley Society have a discussion meeting for further details please see their newsletter for Sept/Oct. At the Drawing room, Stephens House, East Finchley, N3 3QE. Non-members £2. Wednesday the 28th of October, 10.20am, Enfield Society have a three hour linear walk on “Bloomsbury Square and Gardens” by Monica Smith. Meet at entrance to platform 9, Kings Cross Mainline Station. In the August edition the Wembley History Society talk on Friday the 18th September was shown as stating at 7.45pm. This should be 7.30pm. The Gresham College lecture at the Museum of London was shown as Wednesday the 16th of September when it is Wednesday the 30th of September at 6pm. (1772), London Evening News, 9th July. (1772), Middlesex Journal, 9th July. (1772), Middlesex Journal, 14th July. (1772), General Evening Post, 14th July. (1772), Morning Chronicle, 14th July. (1772), Middlesex Journal, 21st July. (1772), Public Advertiser, 24th July. (1772), Morning Chronicle, 7th August. (1773), Public Advertiser, 27th February.